We’ve all become amateur meteorologists. In the northeastern United States the weather during the past week has ranged from cloudy to fog to rain, with rain having more than a fair share. Under normal circumstances, we would stay inside under shingled roofs, and take along an umbrella and galoshes when going out. During Sukkos, however, we’re dependent upon the elements. A Sukkah has walls and a minimal roof — one designed to provide shade, but not protection from falling water. So our ability to fulfill the Mitzvah of living in the Sukkah has been challenged. Each day I’ve been closely in touch with weather reports, tracking radar maps to see when the next thunderstorm, shower or drizzle is on the way. In synagogue coatrooms, we hang our raincoats as we chat about whether we were fortunate enough to eat in the Sukkah, at least for part of the meal, or whether we were rained out entirely. We’re looking forward to sunny weather for the weekend, but our new awareness of the weather has put us more in touch with our vulnerability. I passed a number of homeless people on the street today. Many of these are people who are handicapped, or mentally challenged — and who is to say that their lot in life couldn’t have been mine, or won’t be mine. 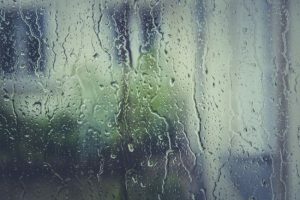 My house is (thank G-d) offering secure protection for our family, but moving out to the Sukkah, or attempting to do so under these weather conditions, has led to the humbling thought that G-d could have ordained such a flimsy structure as my permanent home under different circumstances. I’m ever grateful that is not the case, but I also understand that I’m fully dependent on G-d’s plan. Our dependence on G-d — and our gratitude to Him — are consistent themes in the prayers and practices of Sukkos. We take the Four Species (Lulav, Esrog, Hadasim and Aravos) and shake them as we say “Hodu Lashem Ki Tov, Ki L’Olam Chasdo” — “Give praise to G-d for He is Good, Forever is His Kindness,” six times during the Hallel prayer , plus twice as we say “Ana Hashem, Hoshiyah Na” — Please, Hashem, please save. This is then followed by a march around the synagogue, saying prayers whose constant refrain is “Hosha Na” — Save [Us] Now! May we take these messages of vulnerability and gratitude into the coming year, and recognize that all blessing and healing come from our Father, our King — and understand that our efforts and desires must ultimately be focused towards His will. I find your commentary this time, particularly interesting. We know that G-d watched over his children in the wilderness by not wearing out the cloths and shoes for the forty years. But I do not recollect where he gave our forefathers a safe shelter when the need to live in the Sukkah was upon us. I do not know…many times I yearn for the “other” days when we did not have all the tech stuff and life was more about farming for our families, self protection and worshiping G-d in a more intimate manner. Good shabbos.